A courtesy van is available to and from lodging. 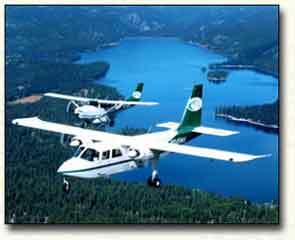 McCALL AIR is your premier headquarters to Backcountry Aviation and City to City transportation in the Pacific Northwest. McCall Air offers City to City transportation for discerning passengers whose time is important to them. Arrange to fly where you want to go without all the hassle. 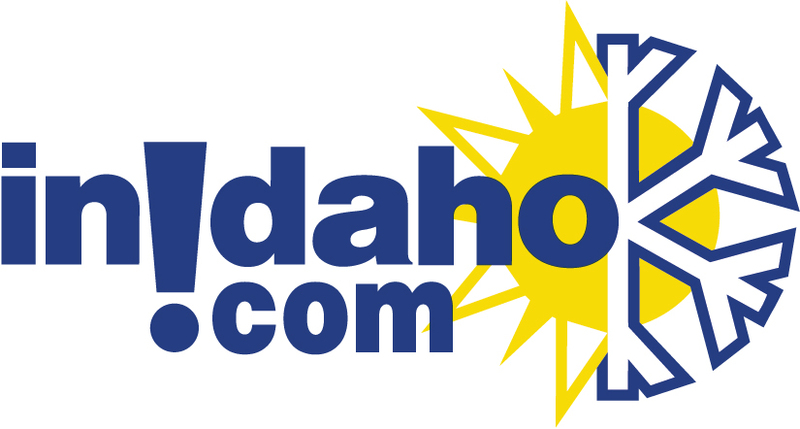 There are daily flights to and from Boise. These flights must be booked 7 days in advance and the passenger(s) must be flexible with departure time within one to one and a half hours. Baggage must weigh in at 35 lbs or less. Rates are competitive with some ground transportation. 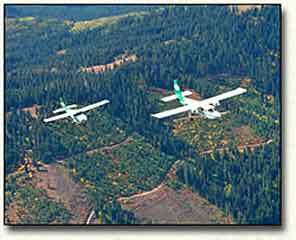 McCall Air also has extensive backcountry flying excursions throughout the year. Spring, summer and autumn months mean transporting wilderness aficionados all over the Northwest for white-water rafting, hunting, hiking and camping fun. 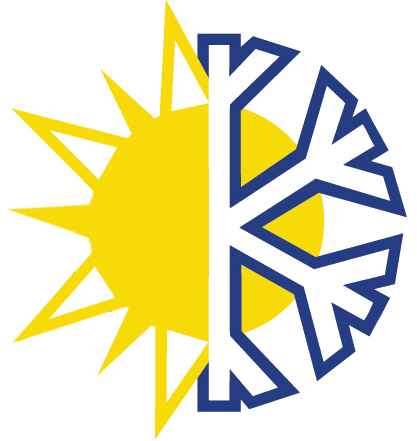 During the snow-filled winter months backcountry ranches and communities are served by delivering groceries and mail. Scenic flights are available year-round as well. If you think Idaho is beautiful from the ground, wait till you see it from the air! What better way is there to travel the Northwest than in your own chauffeured airplane? You're even guaranteed a window seat. McCall Air caters to pilots with excellent FBO services including repair and maintenance, Air BP fuel, and flight lessons. In addition to the many faces of McCall Air and its flying opportunities, a variety of cars are available for rentals around the McCall area. McCall Air can help with all your transportation needs. We do not have any current pre-built packages for McCall Air . Enjoy a morning flight and breakfast at one of four back country ranches. Here's a little more information on each ranch. This ranch is located NE of McCall at the trailhead of the Frank Church Wilderness Area. Located 38 miles southwest of Salmon, Idaho, the Flying B Ranch sits on the Middle Fork of the Salmon River in the Frank Church Wilderness Area. This ranch sits at an elevation of 3600 ft. This ranch is located 48 miles west of Salmon in the heart of the Frank Church Wildreness Area. The Root Ranch sits at an elevation of 5000 feet in a meadow on Whimstick Creek. The Sulphur Creek Ranch is located 50 miles east of Cascade in the Frank Church Wilderness Area. Any destination you choose will provide you with a delicious breakfast and wonderful scenery. The charter prices do not include the price of the meal. Customers are responsible for meal costs. Prices vary depending upon which flight you choose, how many guests will be flying, and what type of plane is required. Please call us today for more information on booking a back-country breakfast flight! Typically this type of trip is available from May - end of September. A variety of cars are available for use around the McCall area. The first 50 miles per day are included. After that each mile is $0.25. Drivers must be 25 and older with a valid driver's license and have proof of insurance. 24/7 pick-up and delivery available for an additional charge. Airport delivery available. Insurance available for $12 per day $500 deductible (state minimum). 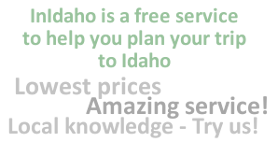 For guests looking for a quick one-way flight to or from Boise, McCall, Salmon or Stanley, Idaho. Seat rates require a 3 passenger minimum. Rates are effective June 1, 2016 - August 31, 2016 and are subject to change without notice. All rates include landing fees and applicable FET. For those guests participating in river trips on either the Middle Fork of the Salmon River, Main Salmon River or Snake River through Hells Canyon. Taking a backcountry flight may prove more time effective for you and an added bonus to an already amazing river trip! Scenic flights are available year-round. If you think Idaho is beautiful from the ground, wait till you see it from the air! This customizable scenic tour can take you over Hells Canyon to the Main Salmon River, Brundage Mountain, Tamarack Resort and throughout the surrounding valley. This could be a great activity for a group of friends or visiting family, special occasions or an afternoon getaway! Trips can last anywhere from 30 minutes minimum up to a couple of hours. Pricing varies based on number of guests, length of flight and type of plane being utilized. Call today for reservation info. Please note: Guest reviews may mention certain amenities that may no longer be offered with McCall Air. Please check the amenities prior to booking to confirm. "McCall Air was great. We thought we were going to have to charter 2 planes, but they got us all comfortably into one. The ride was great, the landing smooth. The pick-up flight was on time and just as great of a trip. We'll call again!" Cancellation Policy**:(May vary with special rates, packages & online bookings) Fare is fully refundable with 72 hours advance notice. Cancellations received less than 72 hours before flight time will be charged 10% cancellation fee and "no shows" will be charged in full.